Strangely, yet another killer band from the Gaggers/Shanghai Wires/Miscalculations/Disco Lepers family tree has arrived with seemingly zero press. I figured that ought to change! 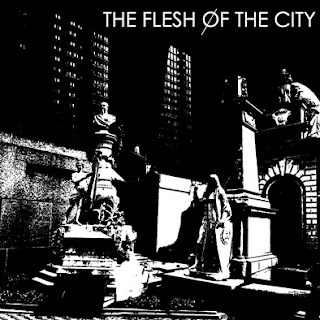 With Marco Palumbo's lead vocals so immediately recognizable, you probably have a pretty good idea of what to expect from The Flesh Of The City. The band name alone makes it quite apparent that you're not in for any easy listening! In the most satisfying way, The Flesh Of The City manages to be the perfect combination of all of the bands referenced above. On this full-length debut, Marco and company deliver eight tracks of menacing punk rock blending snotty vocals, sharp guitars, and bleak visions of a world in despair. Songs like "Visceral Jolt" and "Inside You" lean a little closer to The Gaggers, while "Patron Saint" and "Other Peoples Ideas" would sound perfectly in place on a Miscalculations release. "Flesh of the City", the album's masterful centerpiece, is the best of all of Marco's projects condensed into a single song. I appreciate that the identity of this band is less about a particular musical style and more about the exploration of Marco's dark worldview. A brilliant artist in many regards, he crafts these depictions of life that are disturbing yet incredibly compelling. And the instant he opens his mouth to sing, he's got you hooked. If you long for a time when the lines between punk, post-punk, and new wave were virtually non-existent, this may be the album for you. Get it from No Front Teeth Records in the UK and Dirtyflair Record Company in Australia!